Islamic State of Iraq and the Levant (Isil) has begun minting its own “Islamic dinar” coins, Syrian activists claimed on Tuesday night. Pictures posted on social media showed a series of gold sovereigns bearing Isil inscriptions, and with a reported value of one gold dinar being with $139 (£89). An anti-Isil activist by the name of Abu Ibrahim Raqqawi, who lives in the Isil controlled city of Raqqa in Syria, posted photographs of the coins on his Twitter account, saying they were due to come into circulation soon. Pictures were also posted on pro-Isil social media accounts. Isil announced last November that it would start producing their own currency in areas under its control, in an effort to “emancipate itself from the satanic global economic system”. The currency, based on the original dinar coins used during the Caliphate of Uthman in 634 CE, was set to include seven minted coins: two gold, three silver and two copper. Designs due to be embossed on the gold coins included a symbol of seven wheat stalks – a Quranic reference – and a world map. 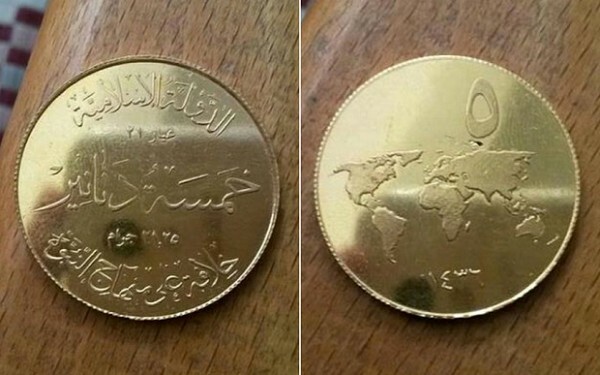 The prototype design had also shown that the coins would carry an Arabic message on the lines of “The Islamic State – A caliphate based on the doctrine of the Prophet”. “A caliphate (ancient system) based (loosely) on the (isis-convoluted) doctrine (propaganda) of the (El Supreme) Prophet” ….. (soon to be trounced by Kurdish Women). Well, I guess they can’t get all the truth on a coin. Somehow, even as shiny-gold-look, it doesn’t appear very pure. Are those dark areas actual blood-spots? Or just fake. SO … WHAT MINT IS DOING THESE FOR THEM?? Oh … ‘Raqqah Silversmiths Union’. The spots are a reflection of the phone camera. You seriously need new glasses. Watch the taqqiya whore spin this into me defending Isis. Get one while you can … for when the IS is only a bad memory you’ll have an interesting ‘collectors item’. Ha! Gold isn’t money, Ben Bernanke said so.